As some LAN hardware are connected with network system likewise some software are necessary to operate the networking system. Network operating system helps to work properly in every network hardwares. Windows 95 and MS DOS is operating software but this operating software did not support previously in networking system. Now a time windows 2000, Windows XP and Linux operating software support networking system. The full form of NT is New Technology. Microsoft Corporation launched Windows NT operating system software version 3.1 in 1933. Windows NT operating system same as MS DOS OR Windows 95 operating system software but this type of operating software is used in networking system. Microsoft Corporation launched this operating software only to use for data transmission from one computer to another computer or networking system. Windows NT operating system software are MS DOS or Windows 95 but the functions are totally different from DOS OR Windows 95 operating system software. Microsoft Corporation introduces a special file system in Windows NT operating system software. Windows NT operating system software is used in server computer and client computer in the network. UNIX is language base network operating system software. This network operating system software was used first in the year 1973-74. SCO-Unix and ATNT-Unix operating system are the part of UNIX network but the function of these two operating systems are same. UNIX network operating system software supports character user interface (CUI). So this type operating system installation is very hard because this operating system is operated by commands. 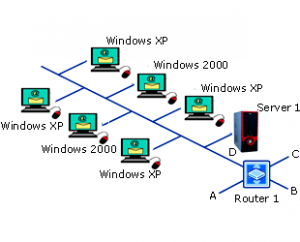 This network operating system is used in server and client machine. The commands are very large in this operating system software. So less users use this operating system software now a days. LINUX network operating system was launched in 1990 through internet. Many internet users used this operating system software previously. Many users alter or modify this operating system software. The data transmissions are very easy in this operating system. This operating system is same as UNIX operating system but operates very easyily. So more users used this operating system than UNIX operating system earlier. Novel Netware operating system is launched by Novel Corporation. This operating system is used for server operating system only. So without server do not transmit data from one client to another client computer. Few users of today use this operating system. Microsoft Corporation at first launched Windows 95 operating system and after modifying this operating system and launched new version Windows 98, Windows 2000, Windows XP, Windows ME, Windows Vista, Windows 7, Windows 8 etc. This operating system supports Graphical User Interface (GUI). Many types of application softwares are used in this operating system with networking system. So data transmission is very easy for this operating system. So this operating system is used for both types of server and client system.